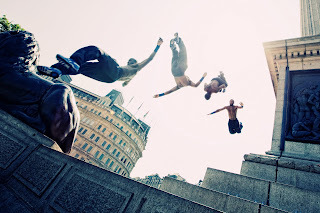 Barclaycard Freerunning (parcour) Championships this weekend - this is gonna be tight! 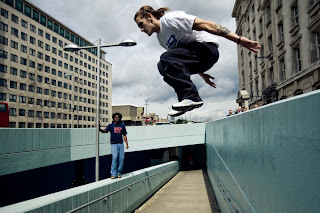 Always striving to bring something new to our readers, we're going along to the Barclaycard Freerunning Championships this Saturday. Or parcour, depending on how authentic you are. 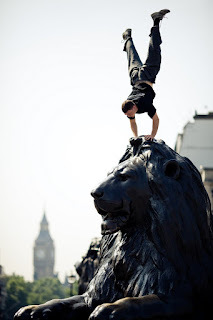 7000 people (according to the press release, not the exaggerated figures given in the newspapers) will pack out Trafalgar Square as it's turned into a live freerunning (parcour-ing?) arena. 27 freerunners from 17 countries will scale the monuments and make people take sharp intakes of breath as they defy gravity. Barclaycard, the sponsor's philosophy: to 'see London differently,' or seeing the city as a playground for springing between buildings, as we see it. Afterward seeing the finals on Saturday, we're sure people will! Set to an individual sountrack, judges are looking for four elements from the athletes: technical difficulty, execution, creativity and fluidity. It's going to be like watching a live action scene in a movie! Unfortunately, with such a high interest, access to the arena was limited to a prize draw on Facebook. With the winners notified, and you're disappointed about not being able to go then don't worry, the live final will be broadcast on Sunday on BBC3 at 7pm. Don't forget to set your reminders.